You read it right! Baguio Day Trip. To those who know this city well-loved by the locals, you ought to know that this trip would cost at least 4-5 hours to reach from Manila and another 4-5 hours back. Obviously it's not economical to spend 8-10 hours of travel time just for a day trip, but that's exactly what we did. To do this, we had to leave as early as 4:30 AM to reach the city just in time when the sun is out. Jojo had invited us a number of times to go up to Baguio City so he can have his picture taken in front of this Lion's Head, a popular landmark and icon of the city. Located at Camp 6, right after the tollgate (toll fee for cars PHP15), this 40-foot high limestone carving of a lion head was a project in 1972 of Lions Club International. For you to see the lion, you need to pass by Kennon Road on the way up (or as you descend from Baguio), and this is exactly what we did last May 24, 2009. Because we're already here, it will be a waste to turn back just because we accomplished our main goal. Instead, we just lurked around the city to find something else to do before we go back. Traffic was bad on the way up the city center due to numerous road constructions and it took us almost an hour to reach the city proper. From afar, we saw people going towards The Mansion House so we decided to stop and do the same. Baguio City is my most favorite city in the country and I have been here a number of times but never did I get the chance to go inside the gates of this famous house. As we parked our car, a taho (a bean curd beverage) vendor approached us and we were intrigued to try the strawberry-flavored taho because the usual flavoring of this delicacy is sugar caramel. Strawberry is a major crop harvest of the nearby town called La Trinidad so we thought it must be a local thing. It was actually good, not too sweet and quite fruity! The Mansion House is the official summer residence of the Philippine President. It previously served as the summer residence of US Governor-Generals during American colonization time and has housed a number of dignitaries as well as events over the course of time. This majestic gate is also said to be inspired by one of the main gates of Buckingham Palace in London. Surprisingly the gate is open for visitors to come in. Most of the time visitors were only able to see things from outside the gate, but in this case I was able to come a bit closer and take photo of the majestic mansion although we were not allowed to come further close. Of course, I wouldn't leave this place without having my photo taken. Right across The Mansion House is Wright Park, known locally for its "Pool of Pines", a long stretch of stagnant water that reflects the pine trees around. At the end of the long stretch of the pool is the park circle which style mimics as if it was built using logs of trees. Walking further to the end will lead you to the stairs that sends you to an area where one can rent and ride ponies in an enclosed place. The stairs is also a famous location for local movies that shoot their very predicatable closing scenes where cast members that were once foes, fighting in a number of scenes in an action film will be surprisingly be featured singing and dancing together and doing some merry-making. We then proceeded to Mile Hi Center inside Camp John Hay to see the outlet stores for sporting apparels, clothing and other imported goods. Most of the stocks are also the same with what we have back in Manila and those that are discounted and on sale are of old models so we ended up not getting anything from the stores. I insisted to checkout the Cemetery of Negativism, something that I had a glimpse on TV years back. The cemetery is located in an area inside the camp known as Historical Core. The graveyard is actually a parody of negative thoughts and serves as a burial of these negative vibes. The cemetery is actually just a small place with a collection of 20 or so tombstones so we were quick to skim around the place. Right across it is the amphitheater, also called as the Bell Amphitheater in honor or General J. Franklin Bell. The Bell House stands proud nearby. Built first as the vacation home of the commanding general, it is now preserved and open to public viewing and serves as a museum containing historical artifacts of its time. Across the entrance of the Historical Core is a small Statue of Liberty. From away it looks interesting but we started to lose interest as we go nearer. For lunch, we went to Forest House Bistro & Cafe as suggested by Jojo. A place serving both local and international cuisine, it is starting to get well known among food critics and the restauant has been featured in a number of magazines and reviews including Philippine Tatler. Inside the restaurant, you will feel the coziness of being at-home. On every table, they serve unleavened bread on the house. It's been a while since I had one and I sure wish I had a meat or fish pate that will surely go well with it. What did I have? Korean Beef Stew! Yes, seeing a lot of Koreans around and memories had me craving for this scrumptuous dish and it has been a long time since I had one. Our plan was to head back home after lunch but before that, I asked to stop by Villa Cordillera first. My mom is fond of the raisin bread served in Baguio Country Club. However, one has to be a member to enter the grounds and buy the bread from the shop. Good thing that a friend gave me this tip years back that you can actually go to a place via a road (Outlook Drive) just behind the club that leads to Villa Cordillera, also owned by the club management. From here, they sell the famous raisin bread to outsiders so as other pastries that are also sold in the country club. As we exit Camp John Hay leading to a road on the way back, we stopped by a forest-like place to take some shots of the trees around the area. And then... off we go, back to Manila! This time, we traversed through Marcos Highway going down. I saw this road that looks like a zigzag from afar and took a shot. I don't think I've ever noticed this before. Few minutes later, we saw a sign that leads to a "view deck". We decided to check out the view deck and take pictures of the mountainous area. 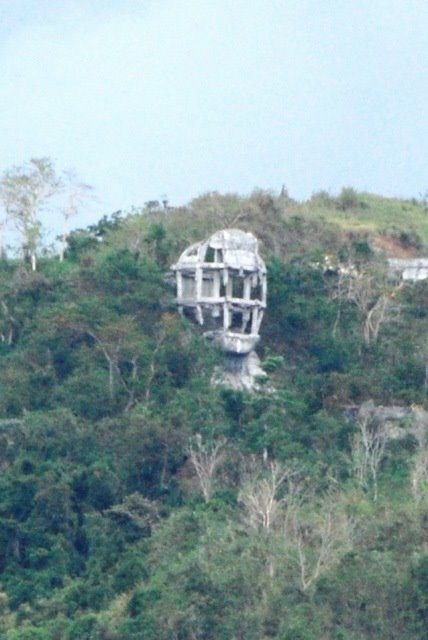 Further down, we also passed by a huge stone head of the late Philippine president Ferdinand Marcos. However it was blown up and blasted years back and now it's almost impossible to distinguish the face from its present form. The whole trip is fantastic even for such a short time stay of just 5 hours in the city. To cap it off, we had early dinner in Isdaan in Gerona, Tarlac midway back. amazing as to how you managed to go to those sites in one day. baguio is also one of my favorite though it's crowded but the climate is still great. by the way, the banaue trip is july4-5 not july 5-6. we will leave 10pm july3 friday. strawberry flavored taho, that's cool! I would love to try that! haven't been to the cemetery of negativism. nice concept. and cute too. I did not know about the "Cemetery of Negativism." Sayang, sana napuntahan rin namin during our last trip. @pasyalera - yeah! it's good! Balak ko rin sana gawin yan (Baguio Daytour) nung nakaraang Panagbenga, kaso di natuloy. hey!!! I so love all the posts here! am also a traveler by heart :) :) .. traveler na wala pa talagang madaming napupuntahan .. XD! well anyway Good job! keep travelling..